1) As 2019 kicks off, what are your hopes for the brand new year? That it holds some good times. Fun things to be able to look back on. I know there will be bad times, so I am hoping for more good than bad. Good health and healing for my family. 2) Just because an item isn't brand new doesn't mean it isn't valuable. Have you scored any fabulous finds at a second hand store or website? I actually have! There is this really nice store that has second hand clothes that I go to every so often. They have name brand nice clothes. I haven't been in a while, but I really should go back. 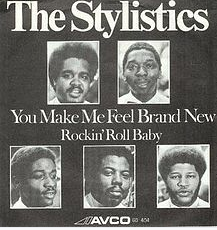 5) The Stylistics took their choreography very seriously. As you can see from the video, they even carefully synchronized their hand movements. Do you use your hands much when you talk? all of the time. 6) The lyrics tell us that the singer is grateful for a friend who will walk with him along a path that "sometimes bends." Looking back on 2018, tell us about a time that life's path took a bend you didn't quite expect. Josh's diagnosis of depression and anxiety. It is a journey we are on and I did expect a diagnosis of depression, but it is so much worse than I thought it was and medicine is only helping a little. It has been nice to be able to talk to my mom and a couple of other friends about it. I worry about him so much as you can imagine. 7) In 1974, when this song was popular, Chicago's Sears Tower opened and was for years the world's tallest building. Its elevators can carry you to the 103rd floor in approximately a minute. When were you last on an elevator? I had a doctor's appointment a few weeks ago, I was on an elevator then. 8) Also in 1974, the 55 mph speed limit was imposed nationwide. When you drive, are you careful to stay within the speed limit? Or do you have a led foot? I drive a little over the speed limit. Hi Lori! I enjoyed your post today!!! Have a happy weekend! My answers will post in the morning! It was fun reading yours!! Happy new year! I'm surprised that you find yourself over the speed limit. I'm with you on #9. I don't have a good side! I happened to notice Wednesday Medley that it is National Science Fiction day,I've been watching Outlander and I can't wait until season 4 is on Amazon Video. I'm hooked on the series and the books, I love the idea of time travel. Happy Saturday Lori. I didn't do this week's as I wasn't in the mood to post but I enjoyed reading yours. I'm still keeping Josh in prayer. I too used to drive over the speed limit on highways but I haven't driven a car since 2006. I do miss it though. Have a day of blessings my friend. I hope Josh finds relief--it took me a while to adjust my medications to help with the dual problems of depression and anxiety. I liked your answer to #1. And good luck to your son. I understand what you are going through with Josh and it is soooooo hard and as he gets older there will probably some very trying times when the teenage hormones get added to the mix, but you and he can make it. Just hang in there and no matter how he acts or acts out, let him know you love him. When he gets beyond it, he will remember that and appreciate that you were there for him. Wishing the best for you and Josh, and I hope things get better for him. My husband has depression, so I know how difficult it can be sometimes to watch someone you love struggle with it. For me, it is not a good side or a bad side. I just stink at having my picture taken. Praying for you and Josh.